For those who are new to cooking, the first thing you need to know is this: you won’t get anything to brown in non-stick coated cookware. Stainless steel is the only way to go for beautifully browned meats, but there are some things to know about pans. Temperature is important, so learning to use your stainless is a good idea if you don’t want to ruin your food and destroy your pots. If you don’t know how to use them properly or how to manage the temperature, your food will stick to the pan or burn. Here are some important tips about cookware. Aluminum pans will actually leach into the food as it cooks. That’s why acidic foods such as tomatoes will keep your aluminum pans looking new. Copper pots are used by professionals but are very expensive and difficult to maintain, and they’ll react with acidic foods. Glass pots have poor heat distribution and food will burn. Cast iron pots are porous and trapped grease can turn rancid. They’re heavy and cook well, but they’ll react with food and rust if not properly “seasoned” and maintained. Coated pans, no matter how expensive or well made, will eventually chip off. What you don’t see before the actual chipping begins are the minute particles that wear off and lead to chipping. 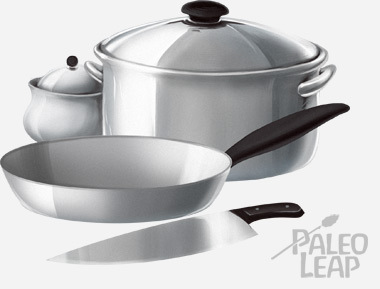 The right types of utensils are needed for all types of pans, including stainless. Stainless steel by itself is not a good heat conductor, so look for pans with copper or aluminum cores. Copper cores conduct heat very evenly, heat up quickly, and adjust to temperature changes quickly. Aluminum cores also conducts heat very evenly and is cheaper than copper. Stainless pots come in various thicknesses, so buy the best you can afford. Cheap stainless steel pots without a copper or aluminum core will cook unevenly, giving you hot spots. Stainless is durable and can maintain its appearance for as long as you own it (some stainless cooks have had their cookware for as long as 50 years). Stainless doesn’t impart any flavor or create a chemical reaction with food. Even the best stainless cookware will get tiny scratches if you use knives on them, but generally, stainless is resistant to scratches and dents. What should you do when it comes to stainless? Cooking is all about temperature shocks and exchanges. The reason a chicken is roasted at a higher temperature in the beginning is to shock the meat and create a nice, crispy and brown skin. The remainder of the roasting is done at a lower temperature. This same technique is used when cooking on the stove top. So what’s the trick to finding the right temperature? When you add your cooking fat, you should see it shivering somewhat in the pan. If your pan is too hot, the fat will smoke and burn. If this happens, discard the fat and start again. The pan will be very hot at this point so take it off the burner and let it cool a bit while you lower the burner and let the temperature regulate. It’s best to heat the pan slowly over medium high heat so it can heat up evenly. This is a great trick you can try in the beginning to get used to finding the right temperature. Heat your pan and place a small droplet of water into it when you think it’s hot enough. If your pan is too cold, the droplet will bubble and evaporate very fast. Placing food in a pan that’s too cold will cause it to stick. If the pan is too hot, the droplet of water will separate very fast into a lot of smaller droplets and move very fast in the pan. Carefully wipe the droplets and let the pan cool down a bit, then try again. If your pan is too hot, food will burn. Even high heat oils such as coconut oil will smoke because stainless conducts heat quickly. When you’re near the right temperature, the droplet will split into smaller droplets of water and then evaporate. At the right temperature, the droplet will stay intact and move around the pan, without evaporating, almost like a mercury ball. This is the time to add the cooking fat and then your piece of meat. Swipe the water from the pan with a paper towel before you add the fat to avoid oil splatter. You won’t find coated pans in restaurant kitchens. Cooking with stainless steel can produce some of the most fantastic dishes you’ll ever imagine. If you learn to use your pans correctly, you’ll never go back to anything else (check out the van der Waals force if you want to geek out on the physics of cooking). You’ll increase your range of recipes and make cooking and eating more enjoyable. If you’re just starting out, here are the basic stainless steel cookware pieces you should have in your kitchen. They’re the sizes most often used by both professionals and home cooks. One, two, and four quart saucepans with lids – These will be your workhorses. Two to three gallon stockpot with lid – For soups, stock, pasta, and sauces. 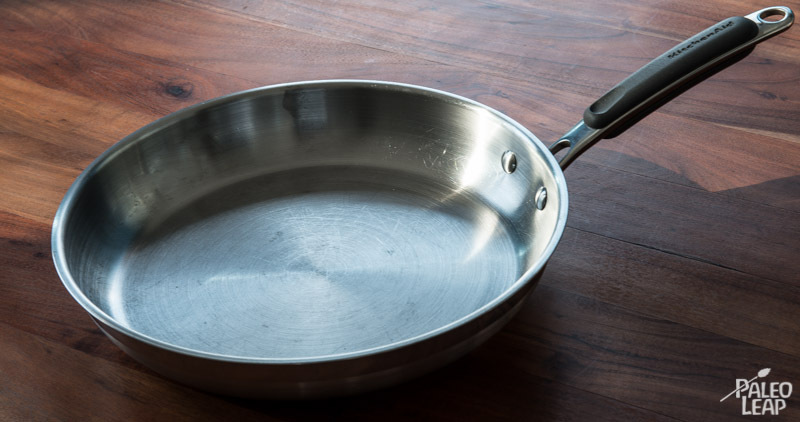 Ten to twelve inch sauté pan with lid – A sauté pan (from the French sauter – “to jump”) has relatively high straight sides and a flat bottom. It’s used for making sauces, pan “frying”, and braising. Ten inch skillet – A skillet (sometimes referred to as a frying pan) has sloped sides that taper in at the bottom. It’s used for eggs, omelets, frittatas or even pancakes. Look for healthy Paleo recipes here. With the right pans, a little patience and practice, and a few good tips, you’ll soon be cooking great meals and impressing your friends while everyone benefits from healthy eating. Use your sauté pan to make a simple pan sauce for chicken or other meats. After the meat is cooked, remove it from the pan. Remove the pan from the heat and deglaze it by adding a liquid such as wine, sherry, fruit juice, or water, enough to cover the bottom of the pan. (Be careful not to let the liquid flame. If it does, quickly cover the pan with a lid). Scrape the brown bits using a wooden spoon and mix them into the liquid, letting the liquid reduce until you’re left with just a couple of tablespoons. You’ve now concentrated the flavor. Reduce the temperature to medium or medium high heat and add about one cup of reduced stock (your bone stock works well here). Add 1-2 pats of butter and stir until it’s incorporated. This will give you a richer sauce. Season to taste with pink salt, pepper, rosemary, tarragon or any herb that suits the meat and the final dish you’re creating. Continue reducing the sauce until it’s thick enough to coat the back of a spoon. It’s ready to pour over your meat or vegetables.